Mr. Myint joined the firm in Fall 2015 and has already tried and received a favorable Defense directed verdict. Mr. Myint's practice areas include commercial, construction, personal injury and mass/toxic tort litigation. Originally from Dallas, Texas, Andrew has been living in Houston since 2010. 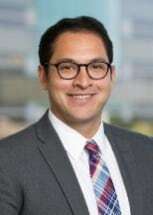 After passing the bar Andrew married his law school sweetheart and in his free time enjoys exploring Houston's robust culinary scene, attending concerts, being outdoors, and spending time with his family and friends.